It looks you have won the Complete 2010 LEGO Technic Novelty Assortment. We now have a winner of this year’s AFOL LEGO® Technic challenge. 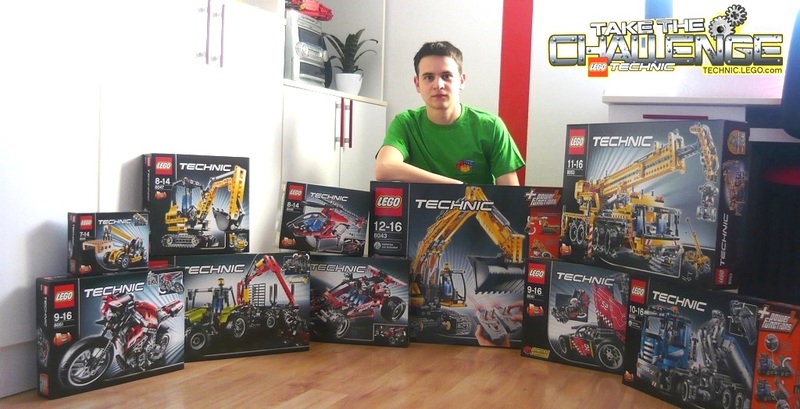 I hope Zblj1987 will enjoy the Grand Price, the Complete 2010 LEGO® Technic Novelty Assortment. It has been great to see all the fantastic models and the creativity you have demonstrated. Many fans has voted and it was a close run as expected with that many cool models. I hope all of you will join us again next year for another round of the LEGO® Technic Challenge. The announcement does not specify which was the most voted model, but for sure it was one from that four below, signed by Jernej. If you did not have the chance to participate on this year's contest, or did not won any of the prizes from the competition, you can still have another chance and join "The LEGO Technic Competition 2011". The second round coming next year. Jernej published meanwhile, one photo with all the boxes he received as a prize. Wish I could've entered this year's contest, but was a little busy this year. Plus, I didn't have all that many sets, or a way to sort the parts. I'll be ready for next time though. "those three below" should be that four? Aaaaaaah shoot! haha well neither of my entries won but zblj1987 is deffinately a worthy winner so congratulations to him. In all fairness i've never been that keen on this years assortment so it's good that he wins it. Well done to him. Besides having both my entries in the final 20 is still pretty cool! Thanks! I am really happy too! I wonder which model won, they stil havent uploaded the pic by previous winners. Gonna have a lot of bricking! Hi to see his winning model look under previous winners, it his Tilt bi-rotor copter.